Be a hero by making a gift or walking in support of local children and families! 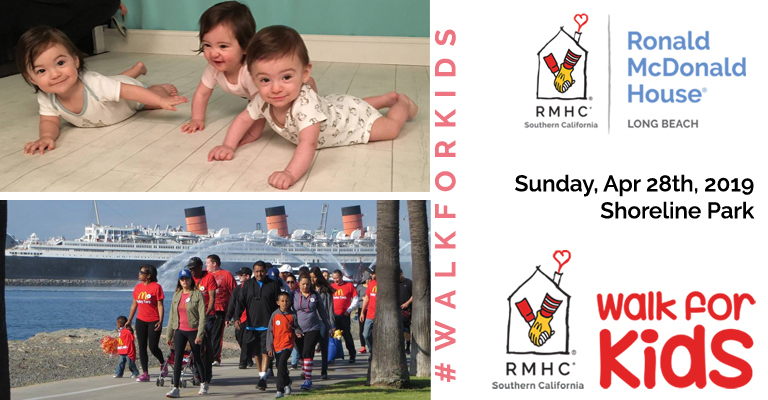 The Walk for Kids™ is a fun, family-friendly 5K walk event designed to help raise funds for the services and programs provided by Long Beach Ronald McDonald House and Ronald McDonald House Charities of Southern California. We need your help to meet our 2019 Long Beach Ronald McDonald House goal of $270,000.00 to help the families staying at our house. The Long Beach Ronald McDonald House goal is part of the Ronald McDonald House Charities of Southern California target to raise $2,250,000.00 so we can help families stay near their seriously ill children at Southern California hospitals and treatment centers over the coming year. With your help, we will be able to support families during the toughest time in their life, while their child is in the hospital or battling a major childhood illness. 100% of the funds raised stay at the Long Beach Ronald McDonald House to help local families. 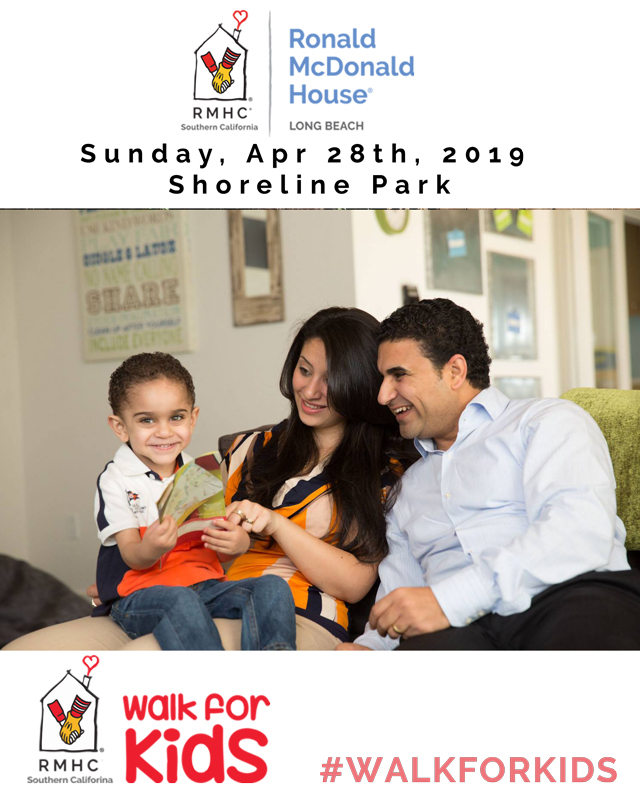 The Long Beach Ronald McDonald House Walk for Kids will take place on Sunday, April 28th, 2019 - 7:00 AM at Shoreline Park, 200 Aquarium Way, Long Beach, CA 90802 in Long Beach. T-shirts and Fundraising Prizes have Arrived! 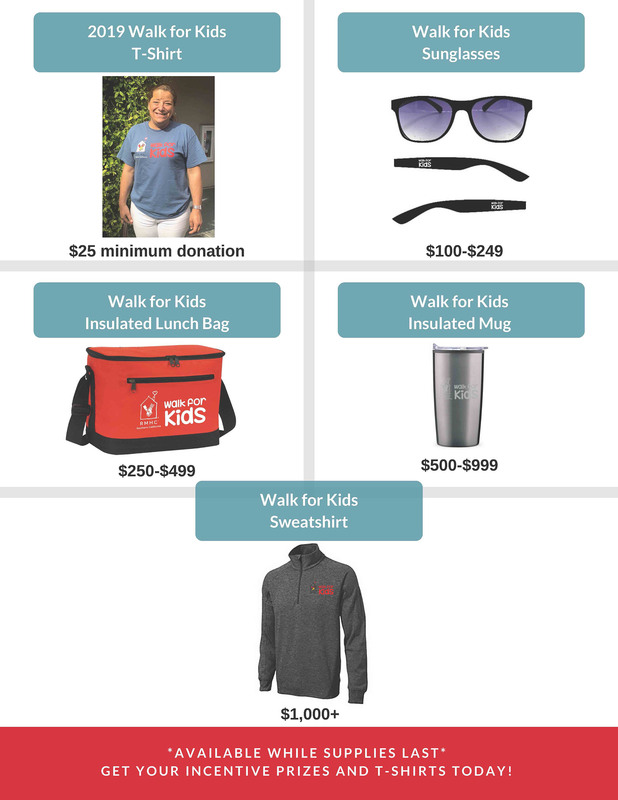 Contact Michelle (mtaylor@rmhcsc.org) to arrange a day and time to pick up your team's incentives and t-shirts in order to by-pass the registration lines on Walk Day! We are thrilled to announce that this year’s Celebrity Walk for Kids Emcee will be Hetty Chang, NBC4 Reporter! Register today and then join us on Sunday, April 28th to join in the festivities. to do something to make a difference locally? 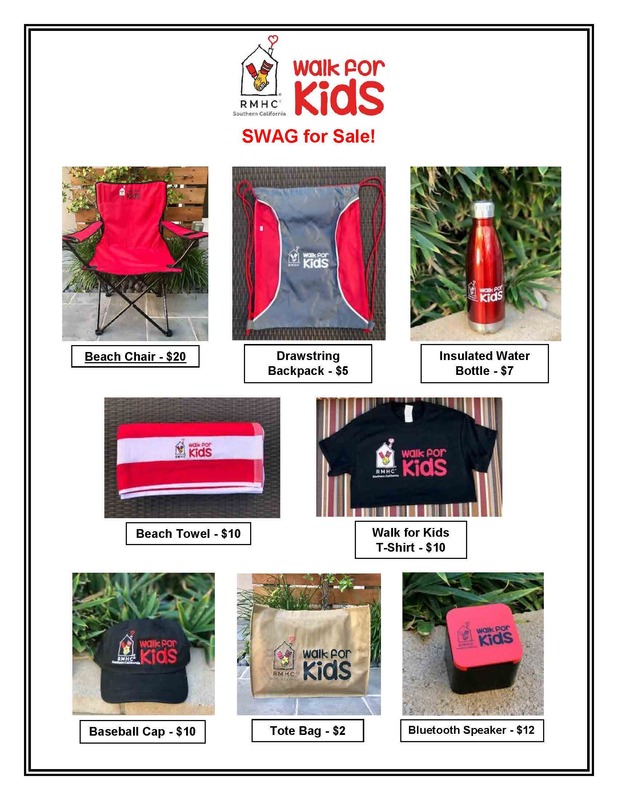 Contact Michelle Taylor to reserve your Walk for Kids SWAG today! Email mtaylor@rmhcsc.org or call 562-285-4308. Having trouble registering online? Fill out and return our offline registration form and our team will take care of the registration process for you! Need some ideas on fundraising? Click HERE to read 100 Fundraising Tips! Like to have your Company or business to help support our Long Beach Ronald McDonald House Walk?